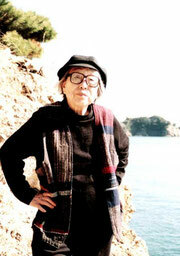 She was born in Osaka, Japan, 1913. The "SA" of SAORI is the first syllable of the word "SAI" which is found in Zen Vocabulary. It means everything has its own individual dignity. And the "ORI" means weaving. In the Bible there is a phrase, "By God's grace I am what I am." This gratefulness in being oneself is common in both East and West. This wonder and gratitude concretely manifests in the form of the woven fabric. As a result, the weaver has the opportunity to encounter himor herself. SAORI helps the weaver to meet one's inner self. And at SAORI- HIROBA weavers can come together to share this experience. SAORI have intimately blended the way of the loom with this quality of individual dignity that the esteems Japanese Zen Priest, Dogen, expresses in the word " SAI" . We think of it as a proud and noble way, or path, uniquely reflecting the heart of individual dignity itself. Presently in our country, Japanese efficiency is given precedence; and even people themselves have lost their individuality. On one hand, many problems have arisen, such as: crimes committed by children, the fall of big business, corrupted bureaucrats, and environmental disruption. But it is precisely because of this situation that activities, like SAORI, searching for the meaning of life have appeared. Having arrived at a materialistic culture, we now seek a peaceful and more humane way to live. "If it isn't enjoyable, it isn't SAORI." I've been doing something that gives me great pleasure. I would like all of you to be able to say the same. It is such a marvel that when you take pleasure in doing something, things go so well. According to Sessyu, the Japanese monk and artist, "Nature itself is a textbook,the teacher exists within oneself." We are also walking this same path. Its significance cannot be taken lightly.